I want to preface this post by saying that I realize that a lot of people put a lot of heart and soul into producing Twitter 4 for IOS. As someone who dabbles in product management, I really appreciate the work that must have gone into releasing this app. I also think you got it wrong and I feel bad for writing a post that essentially trashes your work. Hopefully if you read this, you can absorb these comments in a positive way and agitate for some serious change at the right level in your application. Twitter has long been criticized for the usability of its web and mobile apps, and version 4 of the official Twitter client for IOS 5 is no different. Instead of improving the user experience, this release makes their service more difficult to use. I’ve long argued that in order for Twitter to create long-term relevance as a company, it needs to provide a simple and useful user experience across all of its interfaces. This means getting away from the geeky user-contributed hacks that sprung up in response to shortcomings in the early versions of Twitter. In the early days, these little hacks were endearing to the user community. Then Twitter started trying to help its users by integrating some of these functions into their website and mobile applications. Much of what made Twitter useful in the first place – Hashtags, @user and many other little Twitter specific conventions are hacks that were first adopted by users because Twitter didn’t support several key functions like groups or addressing a note to a specific user. Twitter has made the mistake of trying to integrate these workarounds into the base DNA of their service. Why is this a mistake? These are hacks, which are by definition “useful but inelegant solutions to a problem“. Not scalable, well-thought-out, simple and commercially sustainable solutions. Useful & inelegant solutions. Unfortunately recent releases of both the web and mobile clients have strayed away from useful hack and we’re left with something that’s not near enough useful. Twitter appears to have fallen into the trap of blindly listening to its users and failing to understand what its users are trying to accomplish. Don’t pay attention to what your users ask you for, pay attention to what they are trying to achieve. I digress. This post isn’t meant to be a dissection of everything that Twitter is messing up in their product architecture – they get a lot of things right and importantly, they have over 500 millions users. 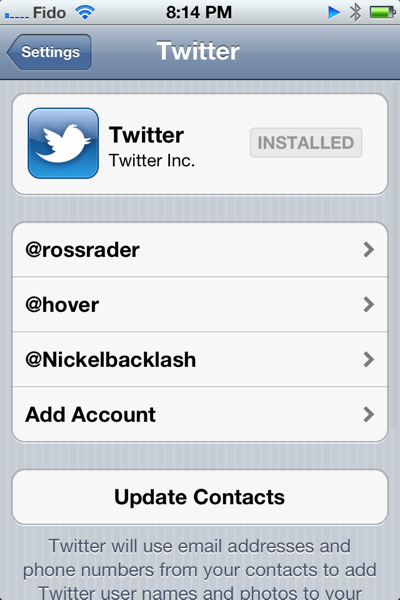 All I really want to do is point out a few things that I really, really don’t like about Twitter 4 for IOS 5. I thought it was helpful to provide some context about things I think they are messing up more generally to make it more obvious why I think what I think about what they are messing up with their IOS version. I believe that much of the confusion swirls around their efforts to simplify features that were poorly conceived to begin with. Moving stuff around on these various screens and giving them different names isn’t going to solve any real problems for Twitter or its users. First off, if simplifying mobile Twitter was a goal for Twitter 4, then some effort should have gone into making it readily obvious what the @, #, include a picture and geotagging icons in the composition window mean. Each of these icons sit at the bottom of the composition window and there isn’t much of an invitation to use them. Even when they are tapped, the function is completely opaque as to what the user should do next. Power users take these meanings for granted and most regular users attribute other meanings to these icons. The @ symbol is most obviously related to an email function, the # symbol could refer to a calculator or a telephone function. Include a pic is probably the best of the four – not much to confuse a user there but right beside it is the geotag icon. It carries no obvious meaning, and even for the most ardent power-users, is so vastly under-utilized that Twitter could probably consider dropping this function entirely. Twitter 4 uses four top-level navigation cues to help users find their way around the software – Home, Connect, Discover and Me. Others have gone deep on why that might not be the best method, definitely worth a read. My complaint lies within the Connect tab – I don’t get it. As a long-time user, I’ve been able to muddle through the functions on this screen and map them back to old functions, but for a beginning user, the similarities between Connect, Interactions and Mentions is going to be nothing but confusing. These labels will need some substantial rethinking before they are immediately obvious to a user. And to make it more confusing, Twitter includes a search function in the Connect tab that doesn’t tell the user its a search function. The form field asks you to enter an “@name” (what’s that?) or a full name. For what purpose? A small UI cue would go a long way here. Further, the Connect tab doesn’t make it obvious at all that most of the tweets and things that are displayed under this tab are interactions that people are having with me, or how they have interacted with my tweets. Sure retweeting is an obvious function for experienced users, but to the neophyte, telling someone that they’ve been retweeted five times is meaningless. Tapping the Discover tab unveils an even more confusing mess of functionality. 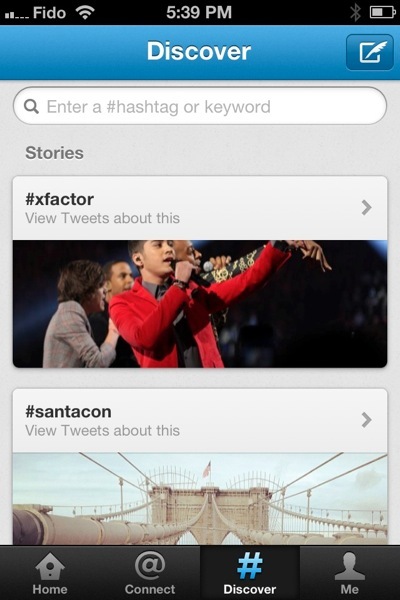 It shows Stories and Trends and gives the user no idea what these relate to. Can I write a story, is this just for reading? Where are my friends? 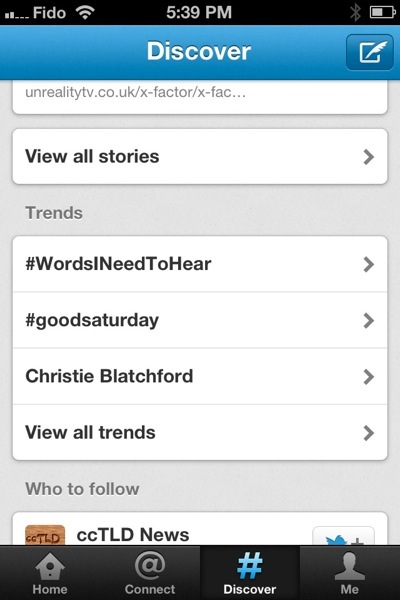 Are these my trends? Usage stats? What? Ugh. A confusing mess. Find Friends and Browse Categories is a lot more obvious, but these are buried down at the bottom of the screen – probably because Twitter doesn’t have much a revenue model around these functions yet. But why is Find Friends and Browse Categories under Discover? Why aren’t they under Connect? Wouldn’t it make more sense to help me connect to people by Finding Friends? Most of my Twitter use is split between a few accounts. 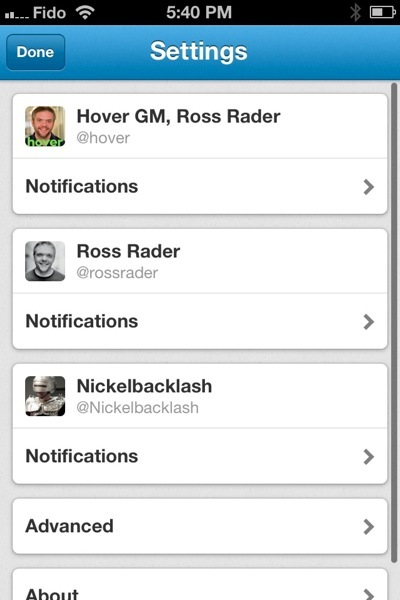 Prior versions of Twitter for IOS made it obvious and easy to switch between accounts. Twitter 4 does not. Guess where its been hidden? As a sub label under “Me”. Worse still, click on “Settings” under “Me” (why are settings and multi-user switching buried here at all?) and you’ll see a weird mix of global application settings (under Advanced) and account specific settings (under notifications). This is in addition to the IOS Twitter settings under System Preferences. 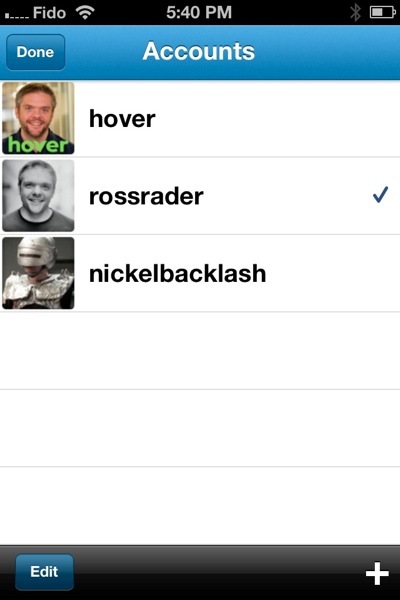 Why aren’t all of these settings nicely tucked into the IOS System Preferences settings for Twitter? As is, it will be really confusing for users to figure out where they should be going to tweak which settings and provides a user with two different means of adding new accounts to the application. This is supposed to be “a faster, simpler way to stay close to everything you care about“. I think Twitter has missed that mark by a mile. It will be extremely interesting to see how the company reacts to user feedback about these changes. At the same time, they’ve announced some pretty sweeping changes to how their website works as well. Their documentation draws some exceptionally clear parallels between the mobile app and the web app. I can only hope that their web app gets it a lot more right than the mobile app did. My overall feeling is that they are re-arranging the UI deck chairs while skirting the more central issue of how to absorb the early user-hacks into real and scalable features within their user experience. I suppose I could just uninstall it. 20 years ago, we didn’t have near the usability expertise we have now. I don’t mean to imply that Twitter shouldn’t allow users to accomplish pretty significant tasks inside their UI, rather, that the company needs to be smarter about designing their user experience. can’t take a tweet in chinese or arabic or or or and take it to a translate app! I think without suggested improvements you are too easy to criticize. Also, you forget that with 500 million users there will always be someone to you know to help you get started with AT or # topic. I mean, I can explain that in 10 minutes to a new users and then the pain is over. Totally fair comment. I’ll document a few ideas when I get some time. I don’t agree though that @ and # are so pervasive that they can form the cornerstone of a large scale ( as big or bigger than Facebook) social service. I really think that Twitter is hurting their chances by trying to get new users to understand what they are and how to use them. I totally agree with you! I’m glad I was able to re-install the previous version of twitter for iPhone. I miss the swipe action. I’m going to give it a few more days. I never like giving something up quickly, just in case its my behaviour getting in the way of me learning a new way working with a service like Twitter. I think I might be able to get used to the new client – although I don’t think that will change their core issues around @ and #, etc. The Android changes are worse still. They took a smooth application with a few wrinkles and made it slow and jerky (on top of all the poor UI choices they made in the iOS application). The Android version also looks frustratingly like the iOS application, which is a definite no-no. So just be thankful that they didn’t dump a spoonful of molases on the iOS version too. I have to say I agree with you that the “discover” tab and the “connect” tab are overly confusing, especially to a novice twitter user. I think that the hash tag and @ symbol are not a problem. They are both simple concepts and that is part of what is so great about twitter- the simplicity. What are your thoughts on the twitter for iPad app? I love it but would love to hear your opinion. I’m not the author, but this guy has been attempting to remove some of the crap from twitter. It’s a chrome / safari extension, essentially just a big stylesheet. I’ve not tried the new iOS client yet, and I agree that it looks cluttered, but I do think some of this article is stretching a bit for things to complain about. For example, “…Connect tab doesn’t make it obvious at all that most of the tweets and things that are displayed under this tab are interactions that people are having with me…”. 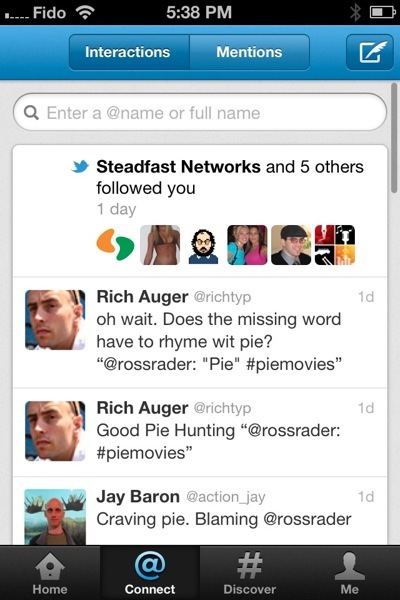 Well, the tab at the top shows that you are looking at the “Interactions” list. I’m not sure how they could make that clearer. The same goes for the Discover tab. Even though I’m not really sure what a Twitter story is, I can see that it’s a way for me to find things that people are following and talking about. I don’t use Twitter to follow hashtags and such as I’m more old school with it (If such a thing is possible.) and just follow some friends and people that interest me. Not forgetting about the removal of slide gesture from tweet list. You have to click on the tweet and go to it to fav/retweet/reply. Ridiculous. 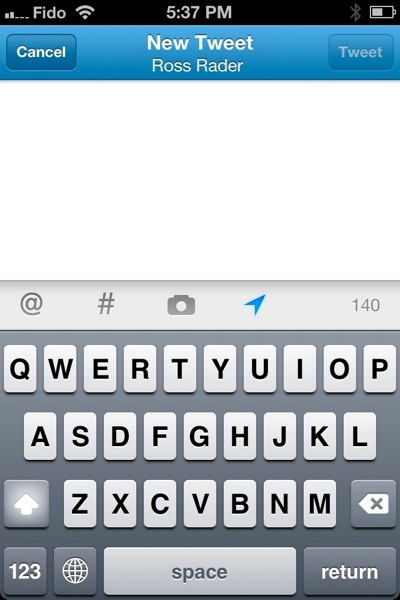 On my Android Phone, you cannot see the 2nd line when typing a tweet because the virtual keyboard cover it up. Not on all Android phones, but on mine. It’s of no use to me now.